This draft excluder craft is easy to make from two pieces of fabric. With a smart contrast detail, it can be used with either side showing. 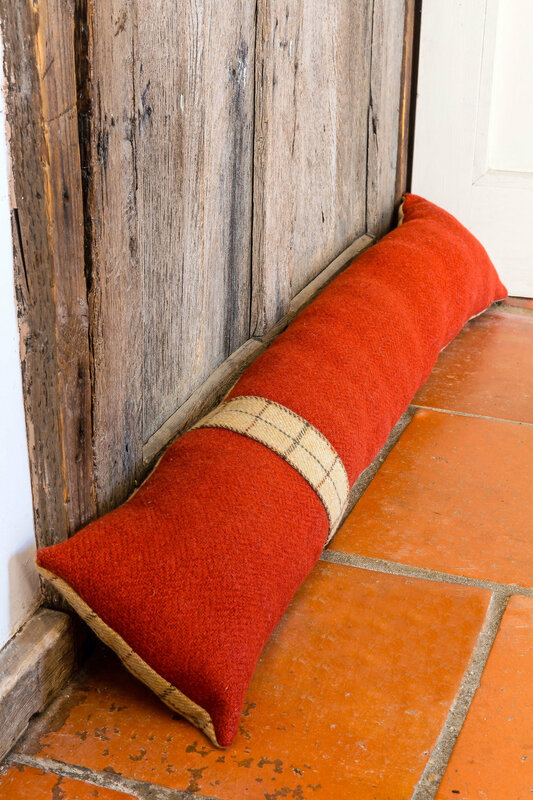 Draught excluders have been used for decades as a way to keep heat in and the cold out. They can sit in front of any door in the house, whether external or internal. Using robust, closely woven, woollen fabrics helps increase insulation and reduces wear. Step 1: With right sides facing, the two small strips are sewn together across the short side using a ⅜in (1cm) seam allowance. A damp, clean tea towel is laid over the seam, which is pressed open. Step 2: With right sides facing, the two larger pieces are pinned and sewn together down one side, using a ⅝in (1.5cm) seam allowance. This is trimmed after sewing to reduce bulk, then pressed open. The joined pieces are opened and laid right side up. Step 3: A ⅜in (1cm) hem is measured and pinned down both long sides of the joined strips. This is pressed in place and hand tacked to hold. The pins are removed. The strip is placed across both large pieces three-quarters of the way down. The plain strip is laid on the checked fabric and the checked strip on the plain. The seam of the strip is matched with the seam joining the large pieces. The checks are also matched. Step 4: The strip is pinned and sewn in place along both its long sides as close to the edge as possible. The matching threads are used so that they do not show. These will need to be changed at the seam to accommodate the different coloured fabric. The hand tacking is removed and any overhang of the strip trimmed back. Step 5: With rights sides facing, the excluder is pinned and sewn across one short side and along the unsewn long side, tucking in the ends of the strip detail. A ⅜in (1.5cm) seam allowance is used. The other short side is partially sewn, leaving a gap for turning and stuffing. All seams are trimmed and the corners snipped to remove bulk. Step 6: The excluder is then turned right side out through the gap and stuffed. The gap is then closed using a ladder stitch.